The current Mazda Five Door Hatch built on the Eastern Seaboard is to be joined by a sedan with a boot. This may not be sold here, but both of the Thai manufactured models will be exported to Australia. Mazda Australia has indicated the revised range will be well equipped, with alloy wheels and curtain airbags among the features standard on the sedan - its first light car with a boot since it discontinued the Mazda 121 ‘bubble car’ sedan in 1996. 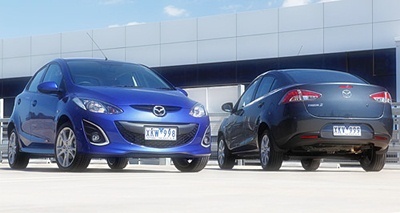 The switch to Thai manufacturing takes advantage of Thailand’s free-trade agreement with Australia, allowing Mazda to slice the five percent import duty from the vehicle’s cost while bringing it into line with products from rivals such as Honda, which imports the Jazz hatch and City sedan from Thailand, and Nissan’s Tiida. A three-door was added to the Mazda2 range some months after its initial launch as a five-door model only in 2007, but this was not seen in Thailand. The Mazda2 will be sourced from the Ford-Mazda joint venture Auto Alliance Thailand (AAT) passenger car plant - the same factory that will build the similar Ford Fiesta in both sedan and hatch forms for Australia. It promises a “dynamic new look” and equipment upgrades, with features including 15-inch alloy wheels, air-conditioning, power windows and mirrors, front, side and curtain SRS airbags, ABS and Electronic Brake-force Distribution (EBD). ESC is already standard. The Mazda2 range will still be powered by the 76 kW 1.5 liter petrol engine matched with either a five speed manual gearbox or four speed automatic transmission. Last week I mentioned that between 1920 and 1928, A.B.C. light cars had a peculiar fuel filler cap. I asked what was it? It was the radiator cap! I wonder how many garages got it wrong? Remember the 1972 Porsche 911? It had a “fuel” filler on the right hand side of the rear guard, which was supposed to be for oil. After filling disasters, the idea was not used in the 1973 and onwards models. So to this week. Ferrari has the name FIAT on their Grand Prix cars because of the association between the two companies. However, this is not the first time the name FIAT has been on Grand Prix cars. When was the last time a FIAT competed under its own name in a car designed and built by FIAT. Hint, after this last race the car was broken up, even though it only raced once. Like most enthusiasts, I can hardly wait for the first Grand Prix of the 2010 season. Up till now it has been very difficult to see just which teams are really strong, it being so easy to confuse the timekeepers by running on high fuel loads or low fuel loads. However, having said that, it still looks as if the top teams are Red Bull, McLaren, Ferrari and Mercedes. But we shall see. There is also the questions regarding rivalry between team drivers. Button versus Hamilton, Rosberg versus Schumacher, Vettel versus Webber, Alonso versus Massa. Roll on Sunday 14 March. The Grand Prix starts at 7 p.m. our time. Forget Car of the Year, we now have the Car of the Decade, according to the press release from Bugatti (owned by VW these days). The Bugatti Veyron 16.4 and its ‘brother’, the Bugatti Veyron 16.4 Grand Sport, has been announced as Car of the Decade by two of the world’s most respected automotive media. The Bugatti Veyron 16.4, first launched in the middle of the last decade, has a top speed of 407 km/h reaching 0-100 km/h in 2.5 seconds. It is certainly fast, even if not aesthetically pleasing to my eyes. With a price of €1.2 million (excluding tax) only 300 units will be made. 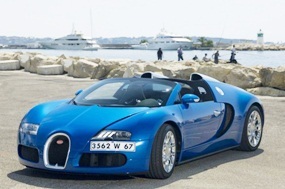 Available from March 2009, the Bugatti Veyron 16.4 Grand Sport has a top speed of 407 km/h reaching 0- 100 km/h in 2.7 seconds with a price tag of €1.4 million (excluding tax). By the way, most of the production will undoubtedly go to the Middle East! The name Fisker may not mean much to most people, but Henrik Fisker is a former Aston Martin and BMW designer who founded Fisker Automotive in 2007 with partner Bernhard Koehler. 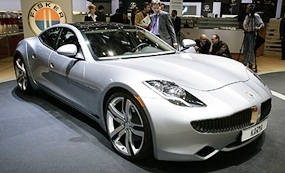 When you look at the Fisker cars, there is more than just a slight hint of Aston Martin in them, and even the grille opening is very A-M.
After building conventional engined cars, Fisker is now entering the plug-in hybrid field with its inaugural Karma four-door plug-in hybrid sedan, which is due for release in Europe in September. This will offer “world-class ride and handling characteristics” and, to prove it, has released details of the vehicle’s aluminium space-frame chassis. Currently being shown at the Geneva motor show, the Karma’s underpinnings are engineered around the so-called Q-Drive series-hybrid powertrain, which drives the rear wheels via two 150 kW electric motors mounted on the rear differential, with extra performance derived from a GM-sourced 2.0 liter four cylinder ‘Ecotec’ petrol engine that acts as a generator rather than a drive unit (very similar to the Chevrolet Volt concept). Described as the “world’s first luxury plug-in hybrid vehicle”, the Karma is claimed to be able to accelerate from 0-100 km/h in “about six seconds” and will have a maximum speed of 201 km/h when operating in hybrid ‘Sport’ mode. It will also have a 2.4L/100 km combined fuel consumption rating and a total driving range of 483 km. In pure-electric ‘Stealth’ mode, Fisker claims the Karma will have an 80km range, a seven-second 0-100 km/h time and a 153 km/h top speed. Full specifications are still to emerge for the Karma, which will be built in Finland by contract manufacturer Valmet Automotive, but the information released at the Geneva show does add some important detail. Fisker claims that the space frame - which is said to be all-new rather than adapted from another manufacturer - incorporates “new levels of rigidity and strength” that will guarantee world-class vehicle dynamics. It said “few cars match its statistics”, with static torsional rigidity measuring more than 33,000 Nm per degree, static bending rigidity at more than 23,000 N/mm, and dynamic stiffness “also world-class”. “Our top priorities when we designed the Karma’s aluminium space frame were that it have extremely high torsional rigidity and could be easily modified to accept Karma model variants,” said Fisker Automotive CEO Henrik Fisker, referring to the four-door and the two-door Karma S convertible shown at the Detroit motor show last year. According to Fisker, a “super-structural” tunnel running down the car’s centreline acts as the Karma’s backbone, housing the lithium-ion battery pack and also acting as a torque tube connecting front and rear sections. Fisker said the Karma’s space frame will also provide high levels of occupant safety and will exceed global crash protection standards. Frontal protection includes a (patent-pending) multi-cell tempered aluminium crush box that can absorb an impact and is also designed to be easily replaced to reduce repair costs. Side-impact protection includes dual-phase 600-series steel reinforced components in the doors and B-pillars. The battery’s location in the centre of the car is also well removed from common impact areas. Apart from the Karma S, there is another Karma-based model variant in the pipeline, along with a second line - understood to be a medium-sized family vehicle - due for release in 2012.